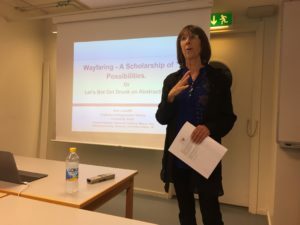 Seminar with Professor Ann Cunliffe on “Wayfaring: A Scholarship of Possibilities. Or Let’s not get drunk on abstraction” » Triple E.D. Today Ann gave her second seminar at USBE. This time it was a seminar titled “Wayfaring: A Scholarship of Possibilities. Or Let’s not get drunk on abstraction.” Ann argue that our academic work is becoming increasingly normalized through the gatekeeping activities of journal editors, funding bodies, ranking systems, and so on. This is resulting in a narrowing of scholarship: of methods, of theorizing, and of ways in which we write our accounts. She suggest that one way of addressing this situation is to build a more pluralistic scholarship of possibilities, one that requires us to humanify ourselves and others. Ann draw on anthropologist Tim Ingold’s notion of ‘wayfaring’ as a metaphor for re-thinking how we might conduct our research as a scholarship of possibilities, and suggest this involves foresight, imagination and reflexivity. Quite obviously this topic a very relevant for studying extreme contexts that by definition, is extreme, challenging what is taken for granted. This entry was posted in Funding, Qualitative methods, Seminar. Bookmark the permalink.